One of my earliest childhood music memories took place when I was 6 years old. My mom took me out for a drive with friends one warm summer night in St. Louis. At one point, the car came to a stop and Mom asked me to stick my head out the window and listen. I heard screams coming from several blocks away. But these weren't wails of agony. They were cheering screams of ecstatic enthusiasm -- from what must have been thousands of people. And under the reverberating crowd noises I heard music. It was a song with an unusual melody that I had heard on the radio many times: "I'm in love with her and I feel fine ..."
Yes, it was The Beatles performing live in my hometown of St. Louis, Missouri, at Busch Stadium in 1966. In recent weeks, the Beatles have re-entered my mental radar. My daughter Kelli has become enamored with "Across the Universe," a creative movie musical based on Beatles songs. To encourage her appreciation for the music, I bought the two-CD soundtrack and we've been playing it around the house and in the car a lot. Just last night, the lads from Liverpool popped up again when I read the new Rolling Stone magazine cover story on "Why the Beatles Broke Up." It's a sad tale of personal differences, control, insecurity, financial battles, and poor choices. But one thing that remains clear is the powerful chemistry these four men had and the indelible impact they had on music and history. "It Was 43 Years Ago Today!" He is in Nashville emceeing the Fab Four Festival. He used the email to point out that today -- August 21 -- is the anniversary of The Beatles only live performance in St. Louis. Take some time today to think about your musical memories and influences. Who keeps popping up in your consciousness? Appreciate them and the gift they have given you. And while you're at it, turn the table. What impact has YOUR music had on other people? Even if it's in a small way, how have your songs touched someone's life? What positive memories will you and your music inspire in others? P.S. 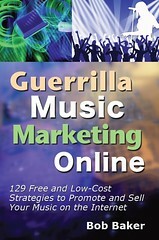 Guerrilla Music Marketing, Encore Edition is the sequel to my popular Guerrilla Music Marketing Handbook. It's not an updated version of the Handbook, it's a completely separate book with different content. So if you enjoyed the Handbook, you'll love the Encore Edition too. Hi Bob....I wasn't around yet when that concert took place but I wish I would have been. I love the Beatles and many other types of music. Being from St Louis myself, I'm glad I found your blog. I'll be checking back periodically if that's ok! Thanks for the post Bob. I love the Beatles and listen to them regularly still today. In fact I listened to the White Album only a few days ago. There always seems to be a Beatle album for any occation. Although that was before my time I remember vividly listening to my father's records. Another artist of that time period that had a big affect on me was Donovan Leach. Loved his stuff when I was a teenager and still do. I love the Beatles, they were a great Rock band, the greatest composers of our time as well.